Entrance gate to the Royal Palace in Fez - articulated with detailed bronze doors, and multiple mosaic patterns in marble and precious stones. 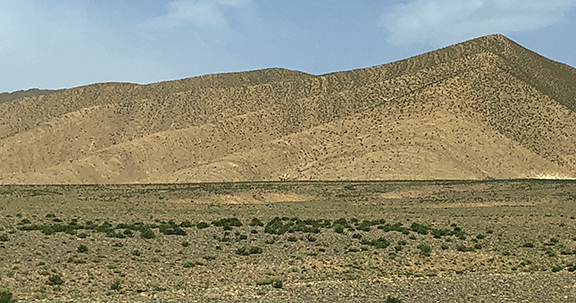 From time to time our blog will pay particular attention to travels in certain countries, continents, or states, where we look for inspiration in plant and building material applications - along with cultural and artistic layering. Today’s feature is MOROCCO. For inspiration, education, to understand different cultures, or simply to see how we, as humans, are all woven together across land and sea, travel is an important motivator, catalyst, and educator for landscape architects and all designers. We landscape architects design outdoor spaces and places, carved or created from nature or natural elements, for all to enjoy. To experience how this is done in other parts of the country or other corners of our vast globe is a wonderful way to grow our design palettes and to bare witness to possibilities beyond our wildest imaginations. Textures, patterns, colors, and materials vary greatly depending on where in the world they are utilized. This could be based on temperature and climate, cultural or historic preferences, religion, availability, cost, or other factors. For instance, colder climates may require special treatments and limited material choices based on freeze and thaw conditions. Warmer climates seem to allow for a larger palette from which to design and build with variety. Breathtaking marble, stone, and clay mosaic work is found throughout Morocco in the form of architecture, art, paving, walls, and decorative elements. The Blue Gate entrance into the ancient Medina in Fez frames a beautiful minaret within. Textural patterns show up everywhere - here at the famous leather dying vats in Fez. The light and subtle tones of a cart on a side street in Fez reflect the ephemeral beauty and age of much of Morocco. Exterior adobe fortress walls surrounding the Medina in Fez. 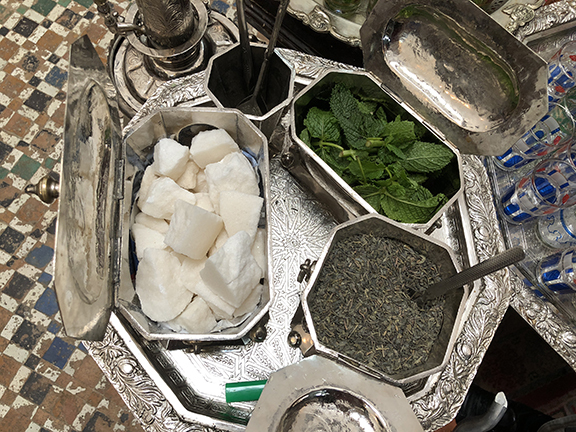 Moroccan Mint Tea being served in traditional style with panache! Preserved lemons, olives, peppers, and other goodies in the market. Brass pattern hammering at its finest! It can take months or years of craftsmanship to complete a tray this size! Clay roof tiles at the ceramic and mosaic workshop are available in multiple colors and sizes. The textures and colors stacked caught the attention of this photographer! Wheel-thrown traditional clay tagine drying and being prepared for glazing. The delicious meals that will be made in these beautiful vessels will please any palette. Decorative lanterns of all shapes and sizes are punched with holes to allow light to create patterns on adjacent walls. These beauties are in the process of curing prior to being glazed. 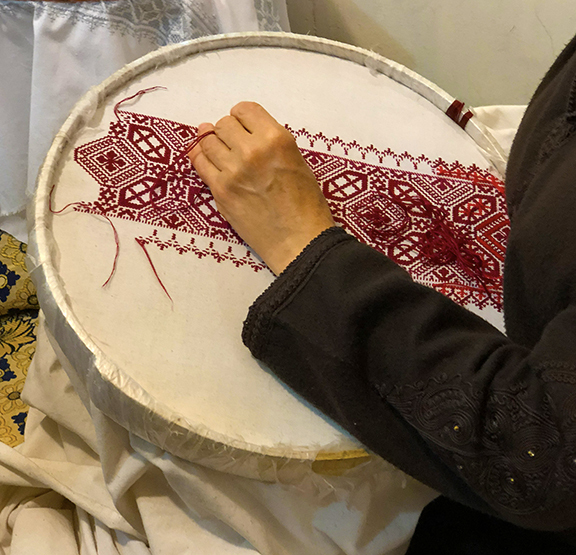 Intricate art of embroidery in traditional Islamic patterns. The detailing and tightness of the stitches is unique to this artistic style. A step back in time - the Roman Ruins of Volubilis. The remains of pillars and square stone blocks that once marked the entrance to colonnaded shops stand as relics to the passage of time and cultural geography. The tools of Moroccan Mint Team making, in beautiful silver vessels on a decorative silver tray. Agricultural fields and irrigation lakes in the foothills of the Atlas Mountains. The Black Desert meets the Sahara Desert near Mezzouga, Morocco. The black is lava from volcanic activity long ago. Breathtaking natural beauty of the Sahara Desert, a couple of hours before sunset. 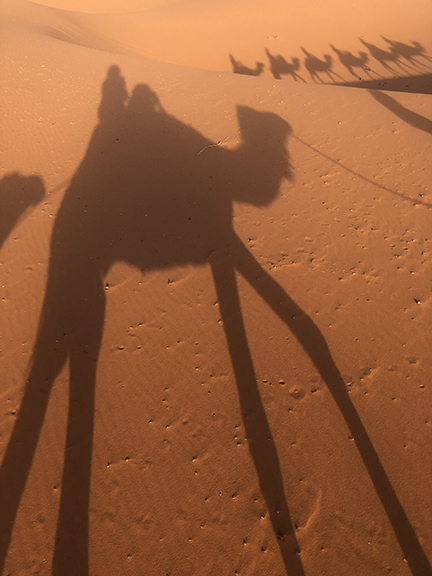 Long shadows of campers and dromedary create a unique pattern on the landscape of the desert. Experience the onset of a desert sandstorm is also a unique experience. No rain came with this storm, just an amazing amount of sand being moved and displaced. 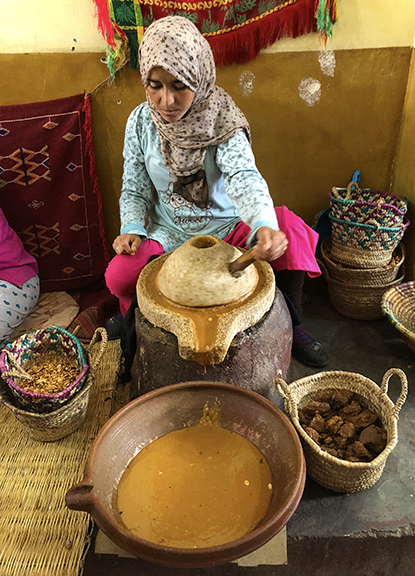 An intimate cooking class in the family home of our guide provided a wonderful experience to learn the tradition method of tagine cooking, replete with local produce, herbs, and spices. A demonstration of the fine art of keeping the embers burning under clay tagines with a bellows. Wood chip carving in traditional patterns, coupled with beautifully hammered and detailed steel decorative elements make for a sturdy and beautiful door. A beautiful young woman grinding the nut of the Argon tree into oil for making cosmetics and natural beauty products. Hard to resist all of the tasty olives, dried fruits and other goodies offered in the marketplaces throughout Morocco. Cabin Creek, Deborah Butterfield’s work focuses on the spirit and form of the horse as an intelligent mare rather than the war horse which is usually illustrated in art. Following our wonderful excursions in Northern Michigan, we drove to Grand Rapids to visit the Frederick Meijer Gardens and Sculpture Park (http://www.meijergardens.org/). Many moons ago, Sandy Clinton, while working with OVSLA in Washington, DC, worked on the overall landscape master plan for these gardens. Fast forward more than twenty-five years and there's no way we could have imagined just how wonderful a place the Frederick Meijer Gardens and Sculpture Park would become. "The Gardens opened to the public in April of 1995. One of the nation’s most significant sculpture and botanic experiences, Meijer Gardens includes Michigan’s largest tropical conservatory; five indoor theme gardens; outdoor gardens, nature trails and boardwalk; One of the nation’s most significant sculpture and botanic experiences, sculpture galleries and permanent sculpture collection; library; café; gift shop; classrooms; and meeting rooms. Since it opened, Meijer Gardens has attracted more than ten million visitors." The tree shaped structural columns and beams create a wonderful "canopy" entry into the lobby of the main conservatory building. The Japanese Garden, within the Miejer Garden, was a highlight for our team. Rainy weather did not deter us from looking at every detail, stepping on every stepping stone, and wondering every path and trail. Through the Tea House window! We strongly recommend an extended visit to the Frederick Meijer Gardens, and send us your favorite images from there. It's a wonderful experience and we are grateful to the Director of Horticulture, Steve LaWarre, for the in-depth behind the scenes tour of the conservatory and support buildings, and a wonderful understanding of the process of such a large botanic garden. Just great! The summer is a good opportunity to take some time to rejuvenate the heart and soul. Temperatures heat up, plants and trees are lush with fruit, flower, and foliage, and our minds and bodies can replenish vital vitamin D, take a refreshing dip in the ocean, and visit with friends and family. At Clinton & Associates, we took a much-needed company retreat in northern Michigan a week ago. Primarily to visit with and celebrate recently completed work at Crystal Mountain Resort in Thompsonville, Michigan. Along the way we visited with our wonderful friends and clients at their beautiful Lake Michigan cottage, and had a chance for a behind the scenes tour of the Frederick Meijer Botanic and Sculpture Gardens in Grand Rapids, Michigan. I believe we all returned with new vigor and commitment to always do our best work! Many thanks to all that made this trip a glorious, educational, enlightening, relaxing, and enriching experience. Lake Michigan shoreline, north of Sleeping Bear Dunes - dramatic, serene, vast! A beautifully hand-tooled stone path with lake-tumbled stone borders creates a beautiful entry path from parking to this home's entry. Love this inviting seating niche at the edge of the garden. Homemade pizzas made to order! What's not to like here? This amazing wood-fired pizza oven can get as hot as 600-700 degrees F! It only takes a minute or two to cook a pizza! Our first Michigan night was topped with a hike up one of Sleeping Bear Dunes for long shadows and this beautiful view of Glen Lake. Where do you find creative inspiration when you are also looking to relax and rejuvinate? Please share your favorites with us.